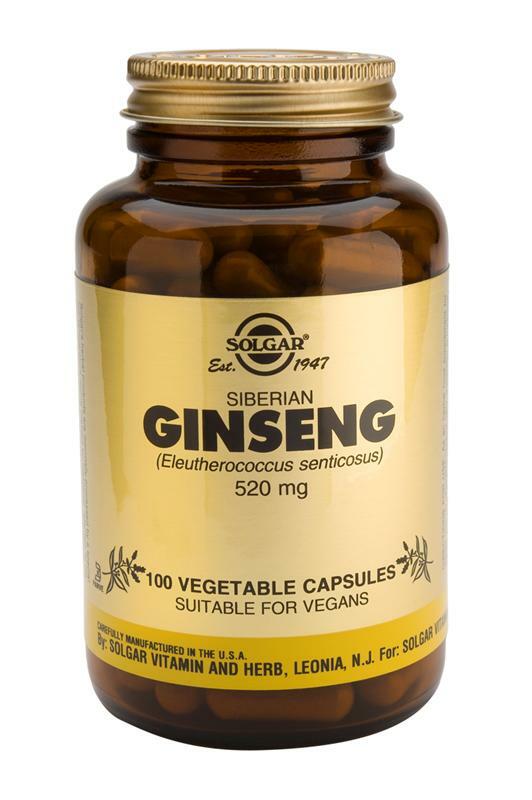 Solgar Siberian Ginseng increases tolerance to mental, physical and environmental stress, helps normalise the response to stress triggers, acts to regulate the manufacture and secretion of adrenal hormones. It also strengthens the adrenal glands themselves, which is especially important to those suffering from chronic stress. As an herbal food supplement for adults, one (1) Vegetable Capsule daily, preferably at mealtime, or as directed by a healthcare practitioner. Do not exceed the recommended daily intake. Store out of reach of young children. Food supplements must not be used as a substitute for a varied diet. Although we take great care in what we say about products on this site, you should always read the manufacturer's label on the actual product carefully before taking supplements. Encapsulated with this natural ingredient: magnesium stearate. Vegetable Capsule shell: vegetable cellulose, vegetable glycerin, water. Although Siberian ginseng is not a true ginseng species, like ginseng it increases tolerance to various stressors (e.g. mental, physical, environmental). This herb helps normalise the way in which the body responds to stress triggers and acts to regulate the manufacture and secretion of adrenal hormones. It also strengthens the adrenal glands themselves, which is especially important to those suffering from chronic stress. Its adaptogenic activity provides non-specific support for the central nervous system, which may help restore proper neurological function after long term stress. Studies show that Siberian ginseng enhances white blood cell activity, thus providing support to a compromised immune system. In addition, as stress suppresses immune function, the adaptogenic properties of this herb would even further promote resistance to infection. This information is not intended to replace the personal recommendations of your own qualified healthcare professional.